FFE Consulting are looking for an FF&E Designer to work in our office in Shoreditch. Applicants must be proficient in Revit with a relevant degree and be able to work on their own initiative as well as part of a multi-disciplined team. Please contact a member of our staff to discuss your project requirements further: Contact Us. Dorsett Hospitality are proud to unveil a summer opening of their highly awaited 4-star hotel; Dorsett City. With rooms already pre-booked and selling fast, the elegantly designed guestrooms, restaurants, bars and communal spaces will allow tourists to truly experience London summer in style. FFE Consulting have been employed since last year to coordinate the delivery and installation of all FF&E from Hong Kong suppliers to the UK site; teaming with Fit-Out Contractor Ayala International and M&E Engineers Mercury, in the successful fitting of furniture, carpet, sanitaryware, mirrors, artwork, signage, curtains, accessories and light fittings across this 13-story hotel. Key areas include all typical guestooms, corridor lobbies, ground floor reception, back of house and first floor meeting rooms. Dorsett Hospitality declare this the "hotel choice for both business and leisure travellers that offers stylish and contemporary accommodation for the most discerning guests to enjoy, relax, party and refresh". This is an exciting time for FFE consulting and as the finish line closes in, we await the final grand-open with much anticipation! On February 15th, FFE Consulting had the pleasure of exhibiting at the ISBA (Independent Schools' Bursars Association) Estate Management Conference at the BMA House, London. With the help of our beautifully designed stands, brochures (and vision goggles! ), we were ready and equipped for a full day of networking. Our event desk had a successful turnout, where Zoe Smithson and Emma Brenton were able to take guests through the complete range of services FFE Consulting can provide. The Exhibition proved highly informative, made up of several breakout sessions discussing and raising awareness on key topics, each presented by a range of speakers. Topics included; cost control, integrated risk management, environmental issues and compliance inspections. For all that visited our stand, it was great having you. After this year's great success. we look forward to seeing you again next year! 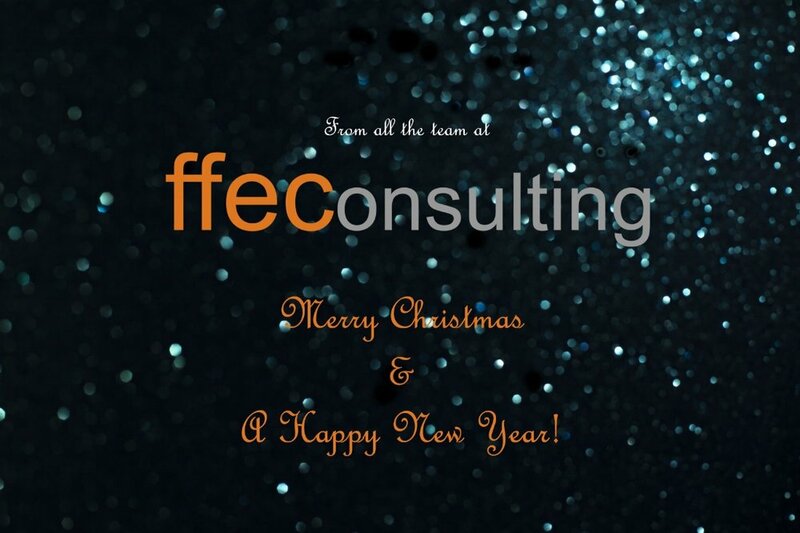 Merry Christmas from FFE Consulting! After a great year, we would like to take this time to thank everyone for a truly positive 2016. We are proud to have embarked on, designed and completed many great projects and have worked alongside fantastic people. We look forward to updating you all in the New Year with the exciting projects that FFE Consulting have in store and from us all, wish you happy holidays. The Team at FFE Consulting. FFE Consulting are excited to finally launch our much anticipated newly designed website; a great way to see out 2016 on yet another high! With a vibrant layout, our new website clearly navigates you through our existing project portfolio, the services we can offer you as well as how to get in contact with one of our specialist team members, should you wish to discuss your project further. We hope you enjoy browsing as much as we have enjoyed the creating process, and we very much look forward to keeping you updated over the next coming months; including some exciting new projects for 2017. News is updated in this section constantly, however please do make sure to keep posted for more exclusive updates via our quarterly newsletters and tweets! FFE Consulting are proud to announce our recent appointment into the hotel sector, working as FF&E coordinators for a 13-story new-build hotel; a 14-million pound project by Dorsett Hospitality International, their 2nd UK hotel following the success of Dorsett Shepherds Bush. Dorsett City Hotel's architectural footprint replaces former office building "The Matrix", right in the heart of Aldgate, London. The project is a collaboration between architects Dexter Moren, project managers Fulkers LLP, structural engineers Waterman Group, main contractors Wilmott Dixon, and working alongside FFE Consulting, Ayala; interior fit-out contractors. Using our team of skilled coordinators and project managers, FFE Consulting will coordinate all FF&E deliveries and manage installations for 270 luxurious guest bedrooms, ranging from typical rooms to suites. Working from a palette of strikingly rich gold and black themes, the FF&E will include artwork, loose furniture and casegoods, carpet, curtains, decorative lighting, mirrors and sanitary ware. An exciting venture for 2017, FFE Consulting very much look forward to updating you as the project progresses!